Is This Bruegger’s Bagels Unlimited Coffee Deal Worth the Cost? How serious are you about your caffeine addiction? If you know your devotion to java is far stronger than any New Year’s resolution, we may have found an awesome deal for you. 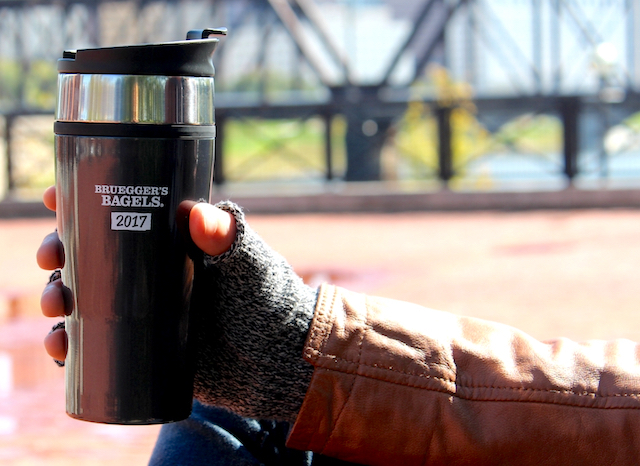 Bruegger’s Bottomless Mug Club memberships are on sale for 2018. And although they’re by no means cheap, if you’re as coffee-dependent as I am, buying in could save you a ton of dough. The way it works is simple: Buy a Bottomless Mug Club membership, which comes with the mug itself, and you’ll get free refills of drip coffee, tea or soda for the remainder of 2017 and all of 2018. While the deal doesn’t work for espresso drinks, smoothies and other fancy beverages, it’s good for hot chocolate and chai tea at some (but not all) Bruegger’s Bagels. You are, however, limited to a single free refill every 30 minutes. Fine print, am I right? Obviously, we’re talking about a pretty massive potential for cheap caffeine here. But how good of a deal is the bottomless mug, really? Depending where you buy it, the mug costs between $149 and $209, but it’s $185 at the vast majority of locations. The price of Bruegger’s beverages is also location-dependent, but according to Fast Food Menu Prices, most small drinks covered by the offer are about $1.99 — and that’s before tax. At that price, if you bought one small coffee every workday — if you work five days a week, you’ll have 261 in 2018 — you’d spend $519.39, plus tax. Which means you’d save more than $300 on coffee in 2018, even if you bought the most expensive mug. That’s not counting the caffeine fiends among you who, like me, could easily blow through a refill or three a day… and who don’t take days off from coffee. Of course, if you don’t always get your coffee from Bruegger’s — or if you only have it occasionally — you might not break even. But if the Bottomless Mug Club sounds like a great deal for you, here are the rest of the rules. Somewhat obviously, you have to get your refills in the mug itself — you can’t just claim to be a member and then bring up some other random vessel. Furthermore, the mug is nontransferrable and only the rightful owner may use it — although you can purchase a membership as a gift. Finally, Bruegger’s will give no refunds unless it revokes your Bottomless Mug Club membership, which it reserves the right to do at any time. The mugs are available at participating bakeries through Jan. 31, 2018, or while supplies last. If you get yours now, you can start using it right away — meaning you’ll save even more cash on your caffeine addiction. … unless you try to get two refills in a single half-hour. Then you might just need an intervention. Jamie Cattanach is a writer whose work has been featured at The Write Life, Word Riot, Nashville Review and elsewhere. Find @JamieCattanach on Twitter to wave hello.